Henry seems have discovered the joy of ice cream… and of eating something with his mouth! It’s been a long time coming… but this past weekend Henry ate ice cream two nights in a row. Yes, I know ice cream is not the healthiest option, but at this point… who cares! We were at my brother’s house for dinner and they served pie and ice cream for dessert. Henry’s 5 year old cousin only wanted a bowl of ice cream, so Henry wanted one too (he looooooves his older cousin!). Honestly, we weren’t expected much, as it was already really late and he looked so tired. But he tried one small taste by smearing at bit on his lips. The next thing we realized he was actually eating small spoonfuls of ice cream! I stared in total amazement… looked at Shawn… who was also staring in amazement… and we both did the “are seeing what I’m seeing” looks, as we didn’t want to disrupt or in any way distract him. Gotta love peer pressure (when used for good, not evil!). HE CHOSE TO EAT SOMETHING!!!!! The cool thing is… we went to Shawn’s mom’s house for dinner the next evening – she almost always serves ice cream – and he did it again. Calm, in control, focused, determined… he once again ate about 20 small spoonfuls of ice cream. Today’s it’s ice cream… tomorrow…???? 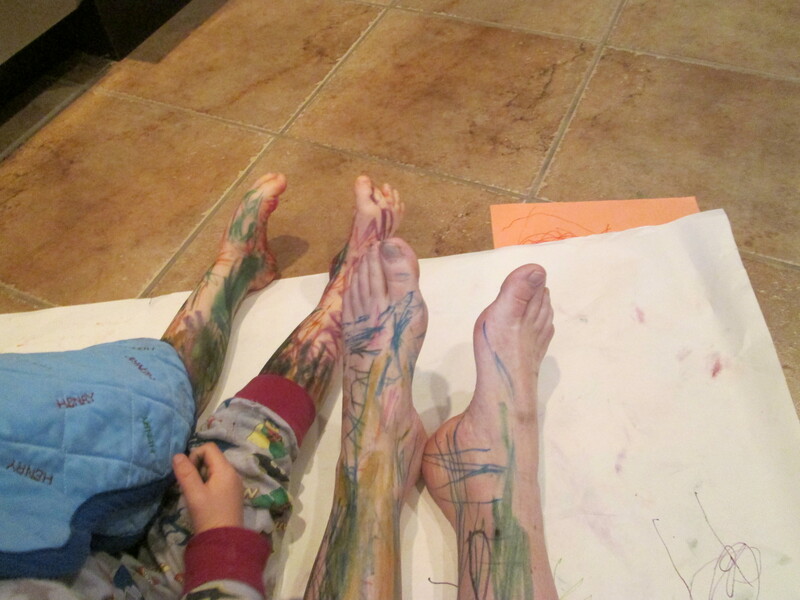 Just For the Fun of It… Felt Pen Leg Drawing! I’d love to say there was some therapeutic basis for this… but really it was just fun! (and a little cathartic, I must admit!). How many times have you told your kids not to write on their hands? 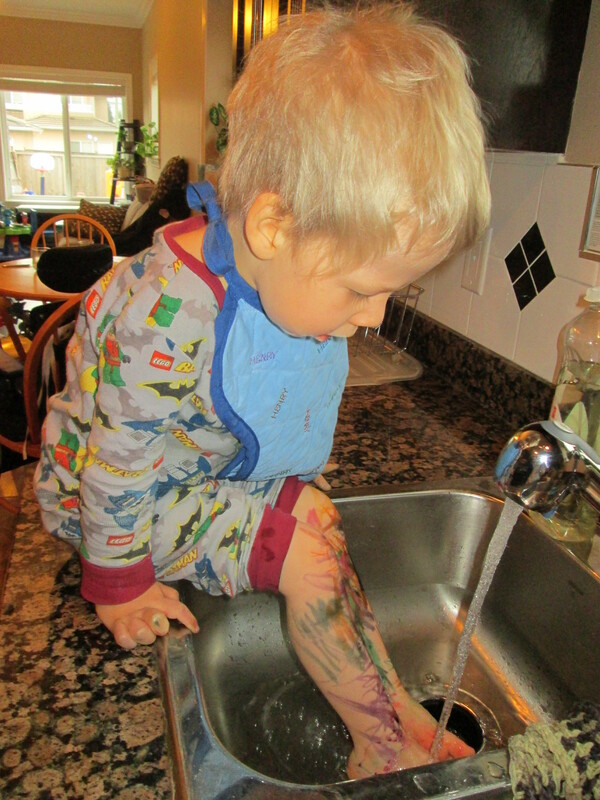 A word to the wise… in my experience Crayola really is better… and much easier to wash off! 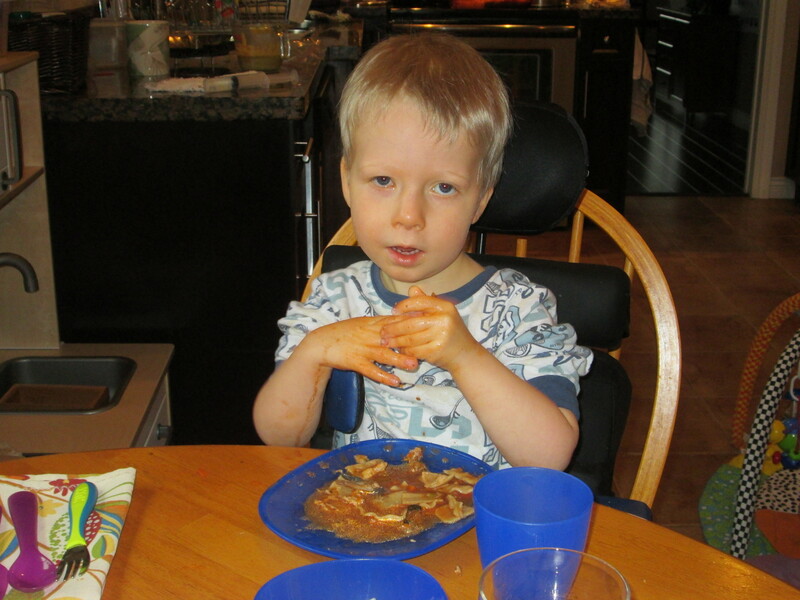 Henry had been asking “how” he swallowed and what happened to the food once it went into his tummy. Being 3… he’s all about bodily functions and how what starts out as food ends up as pee and poo. So, we capitalized on his curiosity and started talking about what happens to our food when we eat. We started our journey at our local library and came home with a load of books. Combined with a few online videos (see a list of resources below), we began to learn. Being a visual person myself, and knowing that Henry was starting to get interested in drawing and crafts, we decided to make a Paper Henry. I must admit, it was really a work in progress… begun without much of a plan. But it turned out pretty well… even if I do say so myself :). Drew an outline of Henry on a large piece of white flip chart paper. 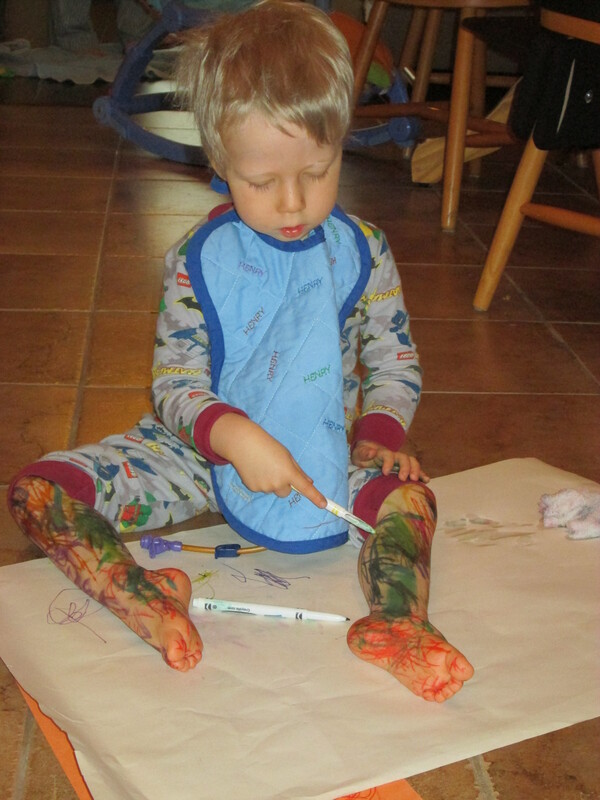 We did with clothes and diaper on – next time I’d either take the diaper off or free draw, as this skewed the proportions. We tackled digestion first, as this is what was interesting at the moment. we used a bolus extension tube for his throat, but any piece of tubing would do. 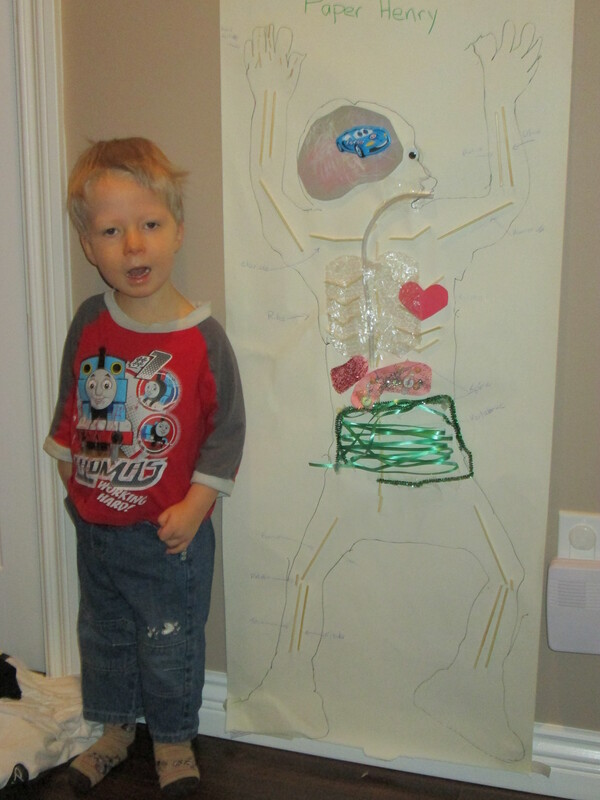 The small intestines are green gift wrap ribbon and the large intestines are pipe cleaners (green in Henry’s favourite colour right now). We looked in the books to see the length of the intestines and measured them out by laying the ribbon out across our family room floor. I had no idea how long it was! Henry was good with this, so I decided to leave it at that, as Paper Henry hung in our front room for quite some time :). Next we did bones using a combination BBQ skewer sticks and tooth picks. Shawn was our researcher and we labeled the various bones as we went. We didn’t worry about all of them… but did quite a few and added in any that Henry specifically pointed out. 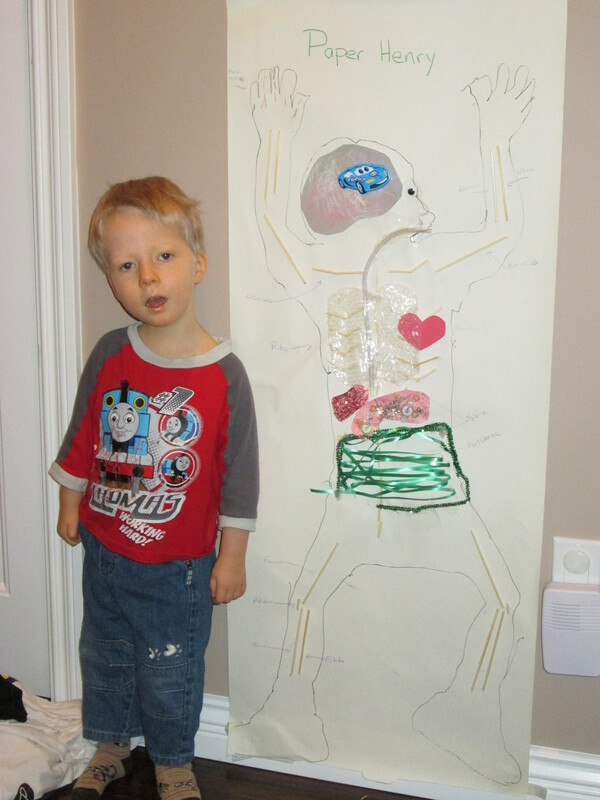 We coloured the brain with sidewalk chalk, and when I asked Henry what he was thinking of… he said cars. So we added in a car sticker. The heart is just that… a heart. Henry is practicing with scissors, so I traced the lines and he cut it out. The lungs are clear bubble wrap… we got a delivery that week, so it was serendipitous :). The final touch… one googly eye (we LOVE googly eyes!). Paper Henry still hangs lovingly in our upstairs hallway. We don’t say “hi” to him quite as much as we used it… I hope he isn’t getting lonely. 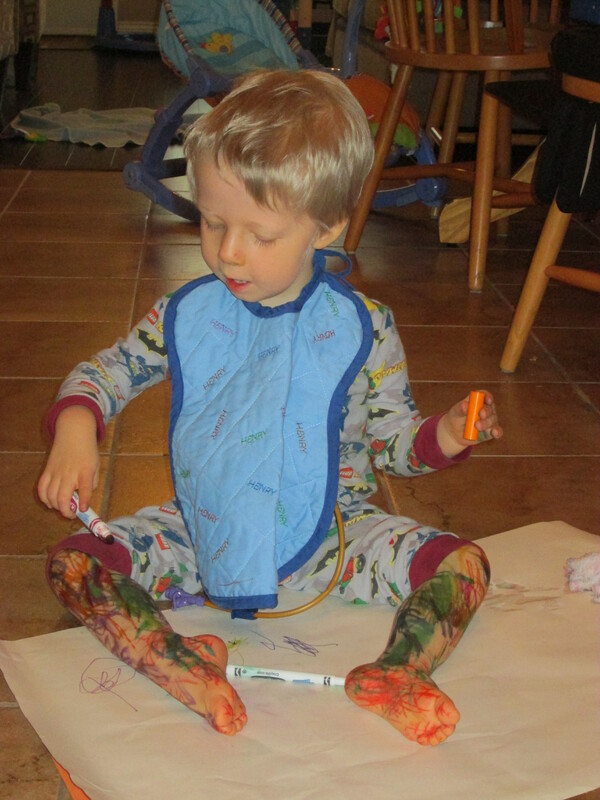 He took about a week to do – each evening I would prep what we would focus on the next day… I guess I miss being in front of the classroom (I’m a college instructor before becoming a full time mommy). He served his purpose well, and we still refer to him when we talk about eating and other bodily functions :). To some… we may have less than stellar table manners. To us… food us for “squishing”, playing, crumbling, trying to cram into our fists and generally exploring with all our senses. And boy have we been exploring lately! Please keep in mind, we started our journey with a little one who would gag when food touched the tip of his tongue. We’ve gone through times when he refused to sit at the table… so we had “floor picnics” instead. 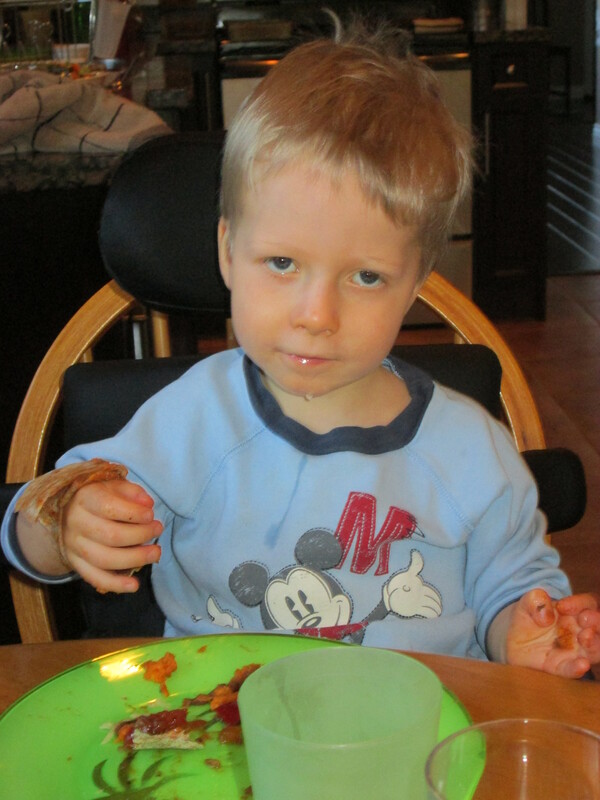 We’ve gone through times when he would touch food with some type of “tool” (cutlery, straws, toys… you name it – as long it could be washed)… but refused to touch it with his hands. He wouldn’t touch playdough or finger paint. And now… we’re messy! And we love it! 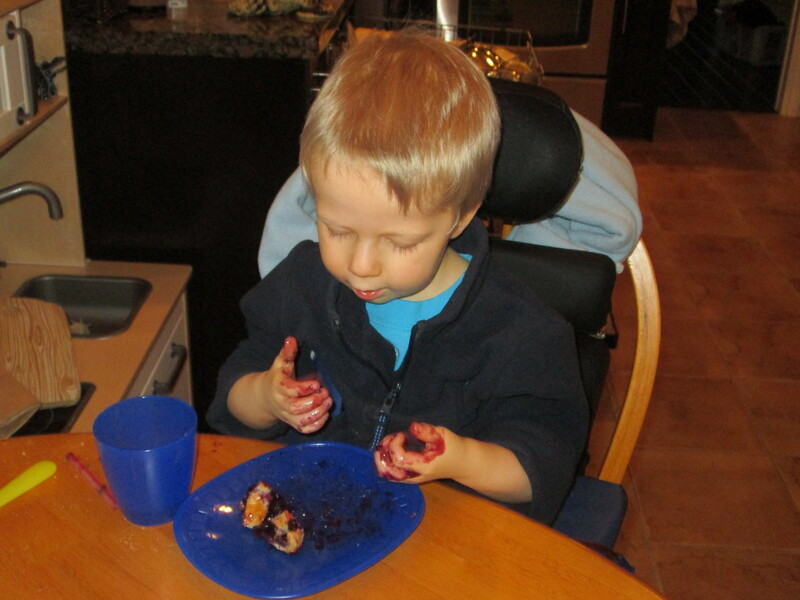 For the past couple of months, his goal has been to stuff everything on his plate inside one fist. Cereal, fajita, veggies… you name it – he crammed it in! I’ve had conundrums about this before, it’s all fine and dandy to make a mess at home, but what about out in public? It’s fine to say what other people think doesn’t matter… but at times it does. But I continually remind myself that my child’s eating is more important that what other people think. And now that Henry’s older, it’s easier to talk about what is OK at home and what is OK when we’re out. It’s a work in progress… but it’s fun! Henry has learned to drink through a straw! I know this may seem like an odd thing to celebrate… but this is HUGE! 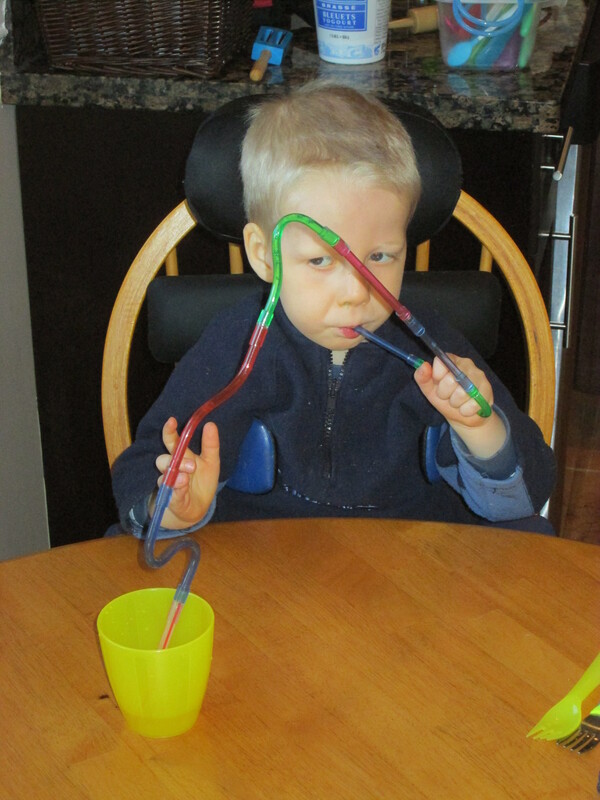 We have been working on the muscle coordination to drink through a straw for 2 years! all the while not loosing hold of the straw while not actively sucking through it! Plus the recognition that different liquids will require different muscle effort… like the difference between water, milk and a smoothie. Like I said, we’ve been working on this for a long time… and then suddenly… he got it! 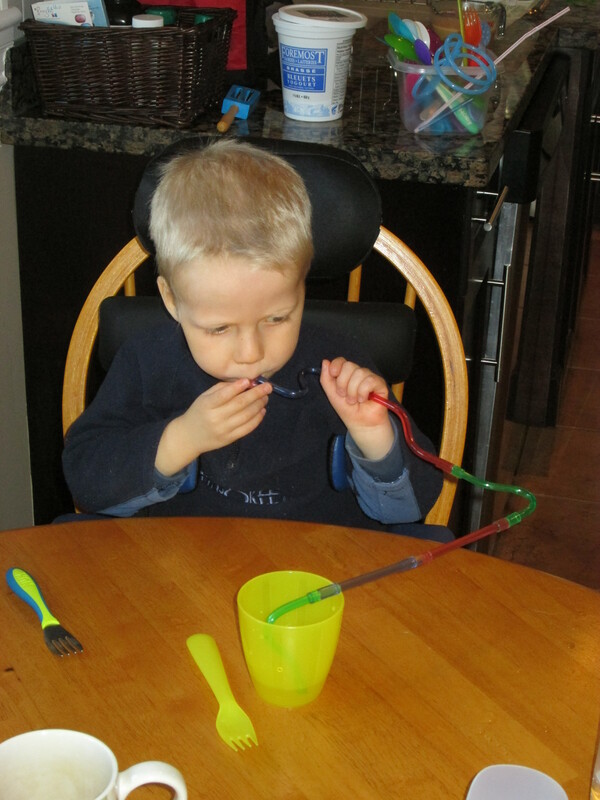 He has been able to blow bubbles through a straw for some time… that was easier. Over the past months he has been getting closer… we could see the milk moving up into the straw, but never to the point of being able to swallow. And the odd time it would get into his mouth, he was unprepared and would choke. But luckily… he would always try again another day. And then… eureka! Chocolate milk (what kid doesn’t like chocolate milk!) was the trick. He just did it. No fanfare, no particular encouragement… Shawn just noticed that he was drinking. He commented on it and Henry got so excited. I’m not sure even realized he was doing it at first :). I think a big factor in his success was the Connecter Krazy Straws I purchased from the Mealtime Notions website. They are colourful, fun straw sets that can be connected to make as long as straw as you want. But the basic pieces are very small… so you can start with a 2 or 3 inch straw and make it longer as your ability increases… the longer the straw – the more muscle strength and control needed. As you can see in the above photos… we’ve had some pretty long ones around here! So… why is drinking through a straw such a breakthrough???? Well… in and of itself, it’s a big milestone and a huge confidence booster. But more importantly, it is pushing the limits of Henry’s swallow. When he drinks from a cup, he takes extremely small sips – 1/4 tsp or less. There is almost nothing in his mouth to swallow, and it can trickle down his throat. There was no way to tell whether his ability to swallow was actually improving. But with a straw, he is now getting larger quantities in his mouth resulting in larger swallows… and he’s doing it! No gagging… no choking… no tears. Just strong, confident swallows! This is why it is such a breakthrough! Is he drinking a cup of chocolate milk… no. But he is drinking a tablespoon… maybe two. For us – this is amazing! This is the most he has ever swallowed in his life!!!!!!!! Amina, our Occupational Therapist, was so impressed she was almost giddy! I don’t think I’ve ever seen her so excited. She was so impressed by how calm and focused he was that she even went so far as to say that he may not need another feeding study. She watched him swallow for about 2 minutes and was just about bouncing in her seat. She said that by watching his neck, she can see the power in his swallow; how there doesn’t appear to be any “trickle” (when liquid is left over after the swallow and trickles down the throat uncontrolled), and there was no sign of distress. To have Amina – the long time proponent of feeding studies – say she thinks he may not need another one… WOW! We still have a ways to go… but this is one HUGE step in the right direction! Henry was back in the hospital again with trouble breathing, for two nights this time. Poor little guy… when he gets sick his little lungs just can’t keep up and he has to work so hard to get the oxygen he needs. This time he woke up at 11pm crying and I could tell right away something was wrong. As before, he showed beginning signs of a cold during the day – runny nose, mild cough – but he seemed ok going to bed. And he wasn’t throwing up, which he often does when sick. He often still wakes up at night, so I didn’t think too much of it as I stumbled sleepily into his room. But you could hear the wheezing immediately. And once I turned on the light, I could see the tracheal tug, his shoulders going up and down and his ribs expanding more than normal. What was unusual though, was the amount of energy he still had. Usually when it’s hard for him to breath, he is also quite lethargic. But this time he helped pack the bag and get dressed. He chatted the whole time and seems happy to be going for a late night road trip. I have to admit, even though he said he was having a hard time, I still second guessed my decision to go to the hospital… he just looked too darn energetic! But in the end I’m glad we went. When will I learn to just trust my little guy’s instincts – he knows his body best. The intake nurse said that his lungs were clear (great! ), but that he was definitely having increased work of breathing. So we waited a few minutes for a room, and began the usual asthma protocol right away. We were optimistic we would get home sometime the next day – but it didn’t turn out that way. In the ER, they couldn’t extend his Ventolin past 2 hours (4 hours between treatments is needed to go home), so plans were made to get admitted. We moved up to the ward and lucky for us, Dr. Hadad, our regular pediatrician was doing rounds so we had a familiar face to check in on us. Again, it looked like we might get home soon, as Henry fell asleep once admitted and seemed to be sleeping peacefully. We even got our discharge instructions! But as soon as he woke up he started struggling again :(. So stuck around another night and by the next morning he was good to go. They added a third medication into his protocol this time – an inhaled corticosteroid called fluticasone (brand name Flovent). I’ll talk more about this medication in my next post. In the end… we’re back home and back to normal. Henry’s still coughing something crazy, which will likely continue for a few weeks as he tries to clear his lungs. But we’re home… the sun is shining… and things are good.